Interstate Mobility is a full service mobility company conveniently located in Waco on the I-35 corridor at the former site of Hafford Equipment. The same great staff of certified and experienced technicians are now with Interstate Mobility…specializing in all forms of wheelchair accessible vans, handicap accessible vehicles and conversions – all forms of handicap mobility aid equipment – whatever your needs, we are here to help. We represent only the top providers of mobility equipment, and are the only authorized dealer in Waco, gladly providing service to the Central Texas area and throughout the state. 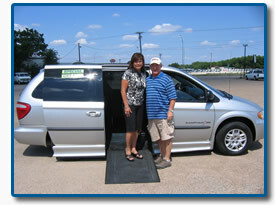 Charlie brings over 35 years of experience as a reputable and licensed, bonded automobile dealer. His vast experience creates a broadened buying and selling market for cars, trucks and SUV's of all types. He has successfully operated Charlie Douthit Motor Co., which was founded in 1993 and previously located on Highway 84 in Woodway, Texas. Charlie Douthit Motor Co. is a member of the Better Business Bureau, Greater Waco Chamber of Commerce, and Baylor University's Big Wheel Club. Charlie and Kathy strongly believe in giving back to their home community, and have served as past Chairmen of the American Cancer Society's Waco Cattle Baron's Ball 2002, and continue their involvement with the American Cancer Society. They have supported Baylor University's - Jeanes Discovery Center, Midway Little League, McLennan County Youth Livestock Auction, the American Cancer Society's Relay For Life and Waco Cattle Baron's Ball, the Junior League of Waco, and other various organizations in the Waco community. Previously employed by Hafford Equipment for over 20 years, Jerry brings a strong background and experience in installing, maintaining and repairing all of your truck & trailer equipment needs. Prior to Hafford Equipment, Jerry specialized for over 10 years with K.D. Manitou providing layout and fabrication for all sizes of lifts and carriages. With over 47 years of combined experience and knowledge, Willie Wise and Jerry Gaskin form a unique Interstate Mobility team. Their goal is to provide YOU with the trust and level of quality service critical to meet your specific needs.